Lucid Group may be an award-winning medical education agency, packed with industry-leading talent, but it still understands how important it is to provide the best customer experience possible. 2015 was an outstanding year for Lucid, followed by an amazing start to 2016. 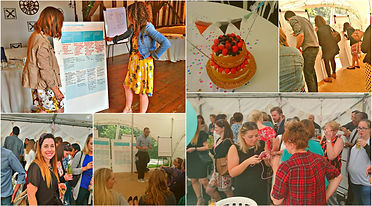 So it seemed timely that, before everyone departs on their summer holidays, the team should take time out to reflect on their successes and share ideas for the future at the annual Summer Meeting. The meeting focused on the different communication channels the Lucid team use every day with both their internal and external partners. Jan Steele (Lucid Co-founder and COO) commented, “We never stop thinking about ways we can improve our customer’s experience and our service offerings. Time spent altogether, as a team, reflecting and developing new ideas and approaches is invaluable. The way we communicate on a daily basis is often not given much thought, but we felt that maybe this is something we should start to be more conscious about.” Lucid is committed to ensuring that it provides the best customer experience possible. This means not only developing the best strategically aligned medical education programmes to improve patient outcomes, but also ensuring that everyday interactions are the best they can be. However, it is never all work, and in true Lucid style the day finished with a party at Lucid HQ. Family and friends were invited to join everyone for a celebratory barbeque. The evening included the grand finale of the Lucid Bake-Off, which has been a fortnightly event over the last 6 weeks. The winners of the previous three rounds baked magnificent show-stoppers for the Lucid judges. Nicki Rodrigues was crowned the overall winner: her fabulous multi-layered sponge cake had lashings of cream and succulent strawberries, and was topped with hand-made Lucid-inspired bunting. Perfect for summer!